Happy Halloween! 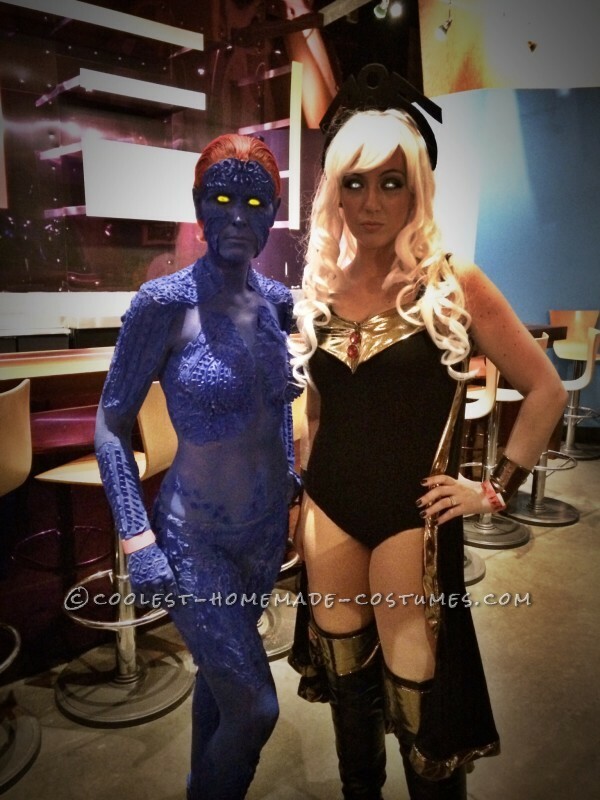 This whole process of making the Mystique costume took about two month of prep work and eight hours the day off. I started with a few picture of Mystique’s character and with clay molded the small scales and spikes on as best as I could to copy the images. This was super tedious. After each piece was complete I poured plaster over the clay to make a mold. Once the plaster was dry I slowly picked out the pieces of clay one by one with a toothpick, then poured liquid latex into the mold. I did a few layers of latex until there was good coverage. You want the piece on the thin side, excuse the reference but think condom thin so the edges blend. Some of my pieces were too thick and the edges really stood out. Once it dried I covered the pieces in baby power and started to pull them from the mold. Make sure you use baby power it will de-stick the pieces so they don’t curl on to each other. I repeated this step…oh about 40 times with various pieces. Once everything was made I used an AirBrusher to paint the pieces blue and then went back through with Navy color for detailing. This was my first time airbrushing. I need some more practice but for the most part everything when OK. The forehead piece had a small patch of fake hair glued to make the widows peak. I made the shoes by purchasing knock off Toms on eBay and rubber cementing some latex pieces on, what wasn’t covered was painted blue. Because I didn’t want to be completely naked but still wanted that naked feeling I took some boy-shorts and covered them with latex pieces and then ran the other pieces underneath the shorts so the bottom half would blend. The yellow contact were purchased from Four Eyez, they were blacklight activated. Day of…get a good friend, a best friend to help! Things will get intimate! I started by glueing the pieces everywhere using prosthetics glue. I will list all the products I used at the end. After everything was glued, we started with the blue paint, after the blue we used navy to detail. Once again, this was my friend first time using an AirBrusher so this obviously isn’t’ professional but I think she killed it. I put in my contacts and lined my eyes with black. Tada, Mystique! YouTube has some great videos of the clay/plaster/latex part of guidance. I think I spent most the night posing for pictures! This was an amazingly fun costume to play with. Coolest Pest Control Family Costume – Catch that Mouse!